GSH/GSSG Ratio Detection Assay Kit (Fluorometric - Green) (ab138881) provides an ultrasensitive assay to quantitate glutathione in mammalian samples. Th GSH/GSSG assay protocol uses a proprietary non-fluorescent dye that becomes strongly fluorescent upon reacting with GSH. 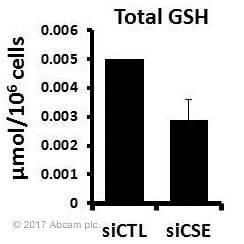 With a one-step fluorimetric method, the assay can detect as little as 1 picomole of GSH or GSSG in a 100 µL assay volume. The assay can be performed in a convenient 96-well or 384-well microtiter-plate format and readily adapted to automation without a separation step. Its signal can be easily read by a fluorescence microplate reader at Ex/Em = 490/520 nm. GSSG levels can be calculated by subtracting GSH from total glutathione levels. NOTE: For measuring GSH Standard only, there is enough reagent provided to perform 200 tests. This product contains a DMSO-soluble probe. If you prefer to use a water-soluble probe, we recommend using GSH/GSSG Ratio Detection Assay Kit II (Fluorometric - Green) (ab205811). Glutathione (GSH) is a tripeptide that contains L-cysteine, L-glutamic acid and glycine. It is the smallest intracellular protein thiol molecule in the cells, which prevents cell damage caused by reactive oxygen species such as free radicals and peroxides. Glutathione exists in reduced (GSH) and oxidized (GSSG) states. Reduced glutathione (GSH) is a major tissue antioxidant that provides reducing equivalents for the glutathione peroxidase (GPx) catalyzed reduction of lipid hydroperoxides to their corresponding alcohols and hydrogen peroxide to water. In the GPx catalyzed reaction, the formation of a disulfide bond between two GSH molecules generates oxidized glutathione (GSSG). Glutathione reductase (GR) recycles GSSG to GSH with the simultaneous oxidation of β-nicotinamide adenine dinucleotide phosphate (β-NADPH2). In healthy cells, >90% of the total glutathione pool is in the reduced form (GSH). 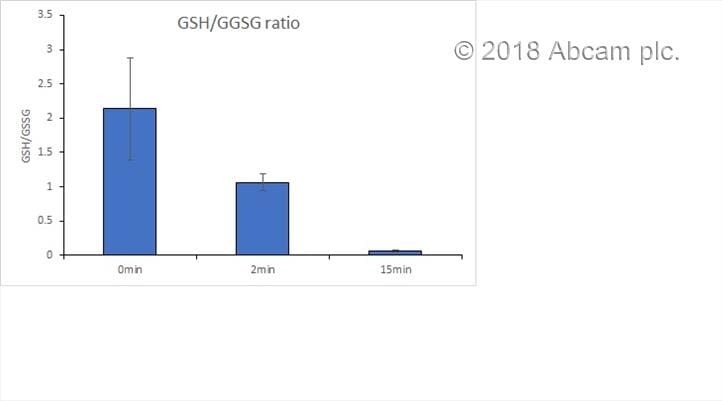 When cells are exposed to increased levels of oxidative stress, GSSG accumulates and the ratio of GSSG to GSH increases. An increased ratio of GSSG-to-GSH is an indication of oxidative stress. Glutathione is a small peptide composed of three amino acids: cysteine, glutamic acid, and glycine and is present in tissues in concentrations as high as one millimolar. Glutathione is the principal intracellular low-molecular-weight thiol that plays a critical role in the cellular defense against oxidative and nitrosative stress in mammalian cells. Diminished glutathione levels have been observed in the early stages of apoptosis. Measurement of reduced (GSH) and oxidized (GSSG) forms of glutathione in myotubes treated with 150 µM TBHP for 1 h (n = 6). 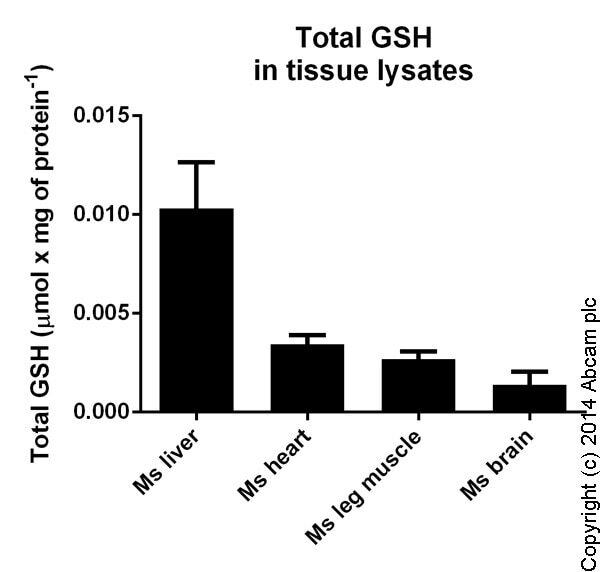 GSH in reduced state measured in cell lysates showing quantity (umol) per 1 mln cells. Samples with the concentration of 1e7-1e8 cells/mL were used. Samples were diluted 10-1000 fold. Total GSH measured in cell lysates showing quantity (umol) per 1 mln cells. GSH in reduced state measured in tissue lysates showing quantity (umol) per miligram of extracted protein of tested sample. Protein concentration for samples varied from 6 mg/mL to 16 mg/mL. Samples were diluted 10-100 fold. Total GSH measured in tissue lysates showing quantity (umol) per miligram of extracted protein of tested sample. GSH in reduced state measured in biological fluids showing concentration (uM) in tested samples. Human samples were diluted 10 fold. Rat sample was diluted 10-1000 fold. 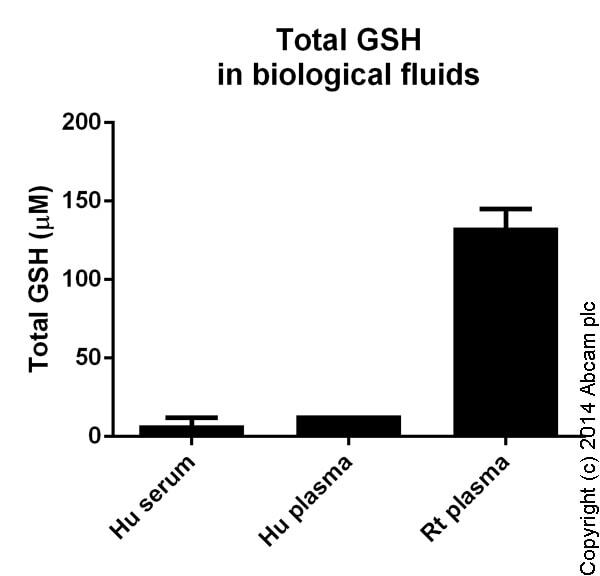 Total GSH measured in biological fluids showing concentration (uM) in tested samples. Samples were diluted 10-100 fold. Total GSH dose responses were measured with ab138881 in a black 96-well plate using a fluorescence microplate reader. 50 µl of GSSG standards (0.01 to 5 µM), GSH-containing samples or blank control were added into each well, and then 50 µl of Total GSH Reaction Mixture was added. Fluorescence intensity was measured at Ex/Em = 490/520 nm after 30 minutes incubation. 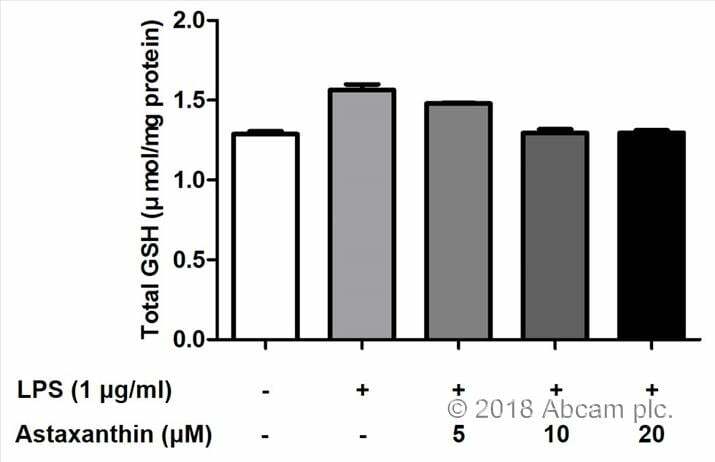 Reduced GSH dose responses were measured in a black 96-well plate with ab138881 using a fluorescence microplate reader. 50 µl of GSH standards (0.01 to 5 µM) or blank control was added into each well, and then 50 µl of GSH Assay Mixture was added. The fluorescence intensity was measured at Ex/Em = 490/520 nm after 30 minutes incubation. Publishing research using ab138881? Please let us know so that we can cite the reference in this datasheet. I used GSH/GSSG ratio detection assay kit to measure GSH levels in the BV-2 cells treated with LPS and astaxanthin. Standard curve was perfect to examine total GSH levels and GSH/GSSG ratio. We used 1 million cells for each samples that were appropriate to detect GSH levels. The handbook was great to perfome this assay and calculate our results. I used this kit to measure the GSH/GSSG ratio in plants after treatment with high light. For this, 6-week- old Arabidopsis thaliana (Col) plants were treated with high light (1000 µmol m-2 sec-1) for 0, 2 and 15 minutes and immediately frozen in liquid nitrogen. Three plants were used for each time point. Each sample was then grinded in liquid nitrogen and 20mg of frozen powder was taken for the assay. I also purchased the mammalian lysis buffer from abcam. 400µl of the lysis buffer was immediately added to the sample after weighing. The rest of the assay and calculations were done according to the protocol provided. We measured GSH levels in OVCAR4 cells tranfected with scrambled siRNA or CSE siRNA. We used Cell Lytic M lysis buffer for lysis followed by deproteinisation. The assay was straightforward and the standards gave perfect plots for quantifying amounts of GSH in our samples. We used I million cells for each sample. Scope of improvement: Providing an assay compatible lysis buffer in the kit will be appreciable. I wanted to measure GSH levels in equine fibroblasts and decided to try the abcam kit. Upon arrival the kit required aliquoting and reconstituting but once this was done it was easy to set up the assay. Some reagents aren't included in the kit (cell lysis buffer and deproteinisation kit) but these are easily ordered from abcam as per the protocol. This assay worked on equine cells and gave similar values as per other cell types provided in the handbook. The kit did however give similar readings for different sample dilutions (before calculations) and therefore raised some concern regarding sample preparation (I used the mammalian cell lysis buffer and deproteinisation kit from abcam). The calculations are quite straight forward but not explained particularly well in the handbook, this would be clarified using a working example perhaps. 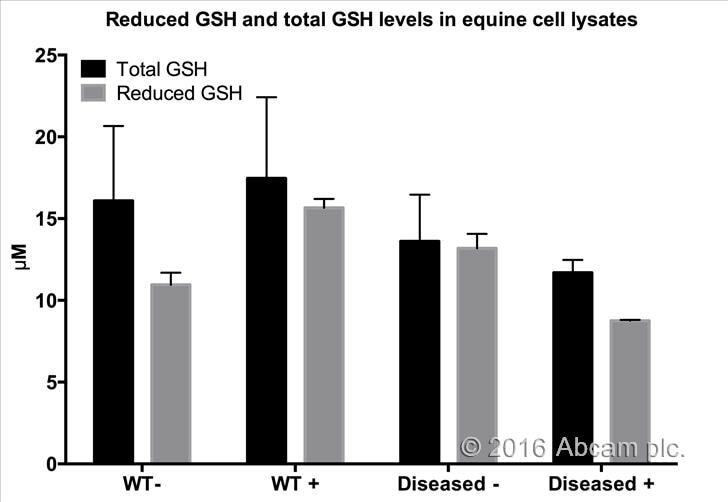 Total GSH and reduced GSH levels (uM per 1million cells) in equine fibroblast lysates. Measurements taken at 1/100 dilution of samples. Mean +/- SEM, samples were run in duplicate. Samples were cultured in different glucose concentrations (- :5.5mM, + :25mM). The FAQ section is the only place to find info about sample prep. I used the Metaphosphoric acid method, and I sonicated the samples after resuspending the cells in this acid. (I used a cup horn sonicator, direct contact, full power, for 10 seconds x 3, so that was very much high power). The assay worked well. I don't like the fact that the GSSG probe comes in a big bottle and that when you make the 25x stock solution in this bottle you have to work very hard to get the 200uL of liquid to come in contact with all the little bits of powder. I ended up solving this problem by putting the bottle in a TC centrifuge for a couple of spins and eventually got all the bits of powder down to the bottom of the bottle where they could be dissolved in the 200uL of liquid. Otherwise I loved the ease of use of the kit. MUCH easier than a GSH-OPA assay! The instruction manual has places where it should be re-written to make more sense and should include info about sample prep.